The proper way to receive the Host in the hand is to place one hand flat on top of the other so that the open palm is facing upward. St John Chrysostom described this beautiful gesture as making of your hands a throne for the King of Kings. In order to indicate clearly that you intend to receive in your hands, you should have your hands in this position already when you approach the (extraordinary) minister of Communion; please do not wait until after the dialogue “The Body of Christ” / “Amen”. 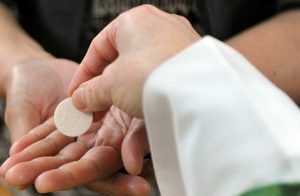 It is not appropriate to receive the Host by taking it with two fingers (as if “plucking” or “pinching”) from the (extraordinary) minister of Communion. Once the (extraordinary) minister of Communion has placed the Host onto your palm, step to the side and consume it immediately by taking it with the fingers of the lower hand and placing the Host in your mouth. It is not appropriate to take the Host with your mouth directly from your open palm.